Besides Crush, our standard range of innovative paper made from process residues from organic products, we work on customized ecological project: an example is CartaCrusca, the paper produced exclusively for Barilla using 20% of bran coming from the Italian mills. CartaCrusca is the paper produced exclusively for Barilla using 20% of bran, which gives a pleasant perception of naturalness and premiumness. 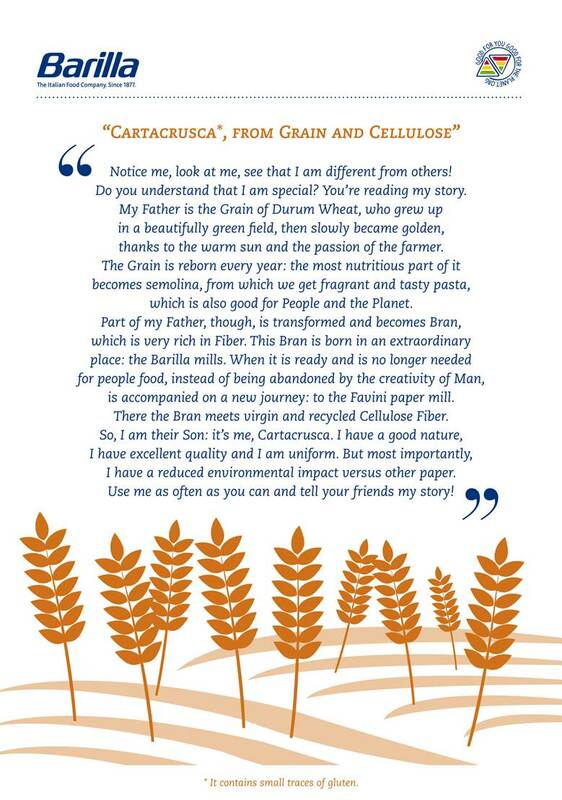 Brought together by a keen sense of social and environmental responsibility, Favini and Barilla, one of Italy’s largest players in the food industry, have created CartaCrusca (Italian for ‘bran paper’), the first paper to be made from bran residues that can no longer be used for human consumption. CartaCrusca contains 20% of bran residues, replacing cellulose and filler materials to produce high-quality paper, which is used for all corporate communications. The colour of CartaCrusca is that of bran, and the paper has an authentic rough feel to it. CartaCrusca is the first fine paper to be made from bran residues that can no longer be used for human consumption, replacing cellulose and filler materials. Based on its experience with Crush, the unique range of ecological paper made from agro-industrial wastes, Favini proved to be an ideal partner for Barilla, which has been looking for ways to make better use of its residues, bran in particular. The research and development teams of both Barilla and Favini worked side by side to select the most suitable by-product and to then purify and mill the bran to make it work with paper fibre. The result is CartaCrusca. Instead of being wasted, the bran residues are given a new life as paper. 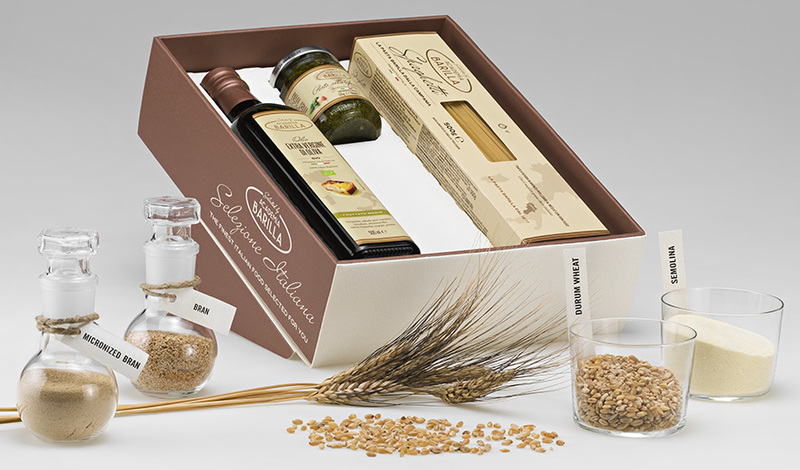 Academia Barilla designed a gift box for food lovers that supports environmental sustainability. The packaging is completely made of CartaCrusca. The box has been conceived to promote the Italian culinary tradition through a selection of top-quality gastronomic masterpieces from different Italian regions. In detail, the box will contain a bottle of top quality extra virgin olive oil, a jar of pesto sauce and a traditional pack of pasta extruded through bronze dies. The packaging is designed in collaboration with DraegerGPP, a company which prints art books and serves luxury industries. The new pack is a blend of culture, cuisine and attention to the environment. The Barilla Company has always been focused on sustainability in all its activities, and the use of production residues instead of raw materials, helps reduce the impact on the environment. 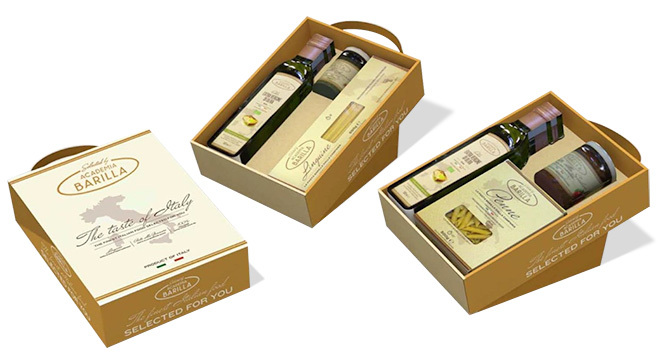 The low environmental impact of this gourmet gift box is a result of the Barilla philosophy “Good for You, Good for the Planet: only one way of doing business”. Since its inception, Barilla has combined the achievement of economic goals with social commitments in all the areas in which it operates. Knowledge of social and economic contexts united with integrity, transparency and innovation, enabled the founders to identify their own entrepreneurial style, and hand it down from generation to generation. Among the Barilla commitments, the sustainability of the life cycles plays a leading role. For this reason, Barilla is committed to guarantee, from the beginning of the cultivation of raw materials up until the consumption, a product life cycle that is up to standard from an economic, social and environmental standpoint. Academia Barilla, is the world’s premier center dedicated to the art of Italian gastronomy and culture. It offers authentic Italian products, culinary training, and cultural education that embody the best of Italian gastronomic heritage. Academia Barilla was founded in 2004, its headquarters are in Parma, one of the capitals of the Italian cuisine renowned all over the world for the quality of its traditional products and the prestige of the food processing industry, and it represents the ideal crossroads between the most qualified representatives of gastronomy and Italian food culture lovers.